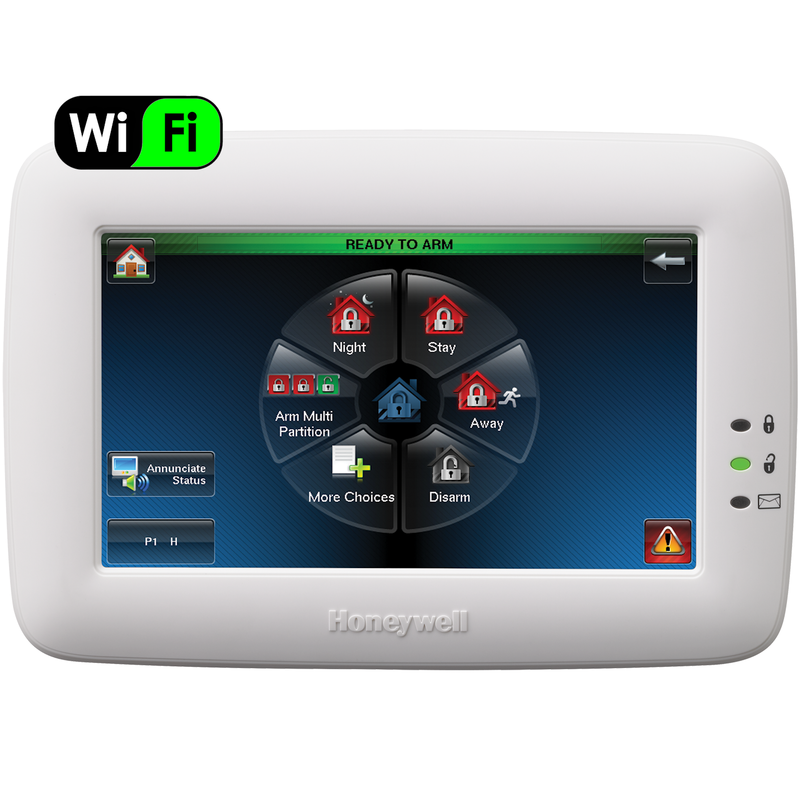 The Honeywell TUXWIFI Tuxedo Touch is a 7", high-resolution graphic touchscreen that functions as an integrated security system, building controller, camera viewer and business communications tool in one. Centralized control of security system, video cameras, Z-Wave® enabled thermostats, lights, door locks and shades from the Tuxedo Touch controller or through any local WiFi® enabled devices. Manage energy costs with customized scenes that can control Z-Wave enabled thermostats and lights based on system events or time and day (up to 30 scenes). Set sunset/sunrise scenes automatically to update based on sunset/sunrise times/changes. Group similar devices (all locks, all cameras, etc.) to reduce programming time and complexity when creating customized scenes. Enhanced security with the ability to view up to four IP cameras right at the keypad. Connect up to 32 MPEG4, H.264 or Onvif format IP cameras and view up to four cameras directly on the Tuxedo Touch display or locally on Wi-Fi enabled devices. Record two-minute videos from any system camera and view right on the Tuxedo Touch display or Wi-Fi enabled devices (15 seconds pre-event and 1:45 post event). Recording can be done manually or set as a scene to activate based on a specific day, time or event. Keep in mind the recording capacity is based on size of the SD card. A built-in web server allows for local control of your Tuxedo Touch system through any Wi-Fi enabled device (smartphone, iPad, iPhone, PC, Internet TV). Honeywell Total Connect™ Remote Services allow DIYer's to control their security systems, view cameras, receive email and video alerts and control their lights, locks, thermostats and more all on the same mobile devices they use each and every day.